Blackpool Illuminations 2017 from the 1st September until November 5th 2017. 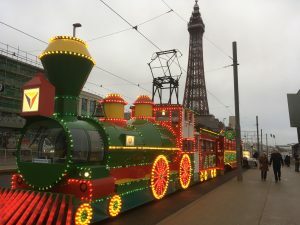 Blackpool Illuminations are an annual lights festival, founded in 1879. (First switched on 19th September that year) The illuminations are held each autumn in the British seaside resort of Blackpool on the Fylde Coast in Lancashire. Also known locally as The Lights or The Illuminations, they run each year for sixty-six days, from late August until early November. At a time when most other English seaside resorts‘ seasons are coming to an end. Dubbed as “the greatest free light show on earth,” they are 6 miles (10 km) long and use over one million bulbs. The display stretches along the Promenade from Starr Gate at the south end of the town to Bispham in the north. Each year during the first weeks of the Illuminations, Blackpool hosts an International Fireworks display. Teams from around the world take turns (weekly) to light up the sky above North Pier.